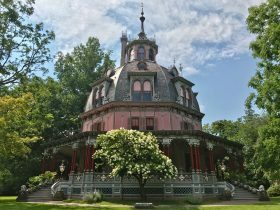 Known as the Armour–Stiner (Octagon) House, this unique home in Irvington-on-Hudson, NY, is the only known residence constructed in the eight-sided, domed colonnaded shape of a classic Roman Temple. The octagon-shaped domed Victorian-style home was listed for rent a few years ago by its current owner, preservation architect Joseph Pell Lombardi, for a hefty $40,000 a month, as 6sqft reported. Now for the first time in its history the house is open for guided tours, so you don’t have to fork over a fortune to experience one of the world’s most visually unique homes. The house is also available as a location for film and photography. 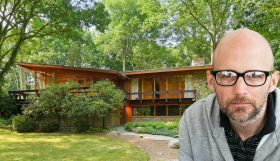 Fashion designer Marc Jacobs has purchased a Westchester home designed by Frank Lloyd Wright for $9.175 million, the Wall Street Journal reported Monday. 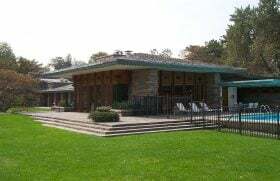 Located in the wealthy Westchester County neighborhood of Rye, the home was built by Wright in 1955 for European car importer Max Hoffman. Located at the tip of North Manursing Island, the waterfront property will serve as a weekend retreat for Jacobs and his husband Char Defrancesco, who recently wed this month. Just 45 minutes from Manhattan, this three-bedroom home in the Westchester County, N.Y. village of Pleasantville, asking $849,000, sits on a 40-foot granite rock cliff. 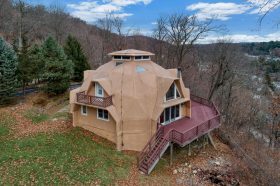 Though that alone might make it a standout property, the 2,519-square-foot home is a geodesic dome, built by the dome kit experts at American Ingenuity, according to Curbed. The current owners built the home to follow their dream of building a geodesic dome within an hour of NYC, with a view, close to town and the Metro North commuter train. Its construction far exceeded the building codes at the time while making it 50 percent more energy efficient than a regular house. Perhaps the perfect gift for your Modernist Valentine, this private island in Carmel, NY (15 minutes by air from Manhattan via rooftop helipad) has an interesting backstory and boasts a Frankly Lloyd Wright-designed house that rivals his iconic Fallingwater. 6sqft reported on the property when it was previously listed in 2017; Curbed reports that it’s back on the market for $12.9 million. In addition to the amazing home featuring Wright’s signature cantilevering and outdoor terraces outside and massive stone boulders within, the 11-acre, heart-shaped property known as Petre Island boasts a Wright-designed guest cottage. 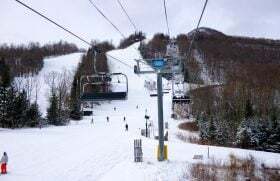 Sure, you’ll find more snow and more serious skiing if you fly to Colorado or even drive up to Vermont, but there are plenty of ski hills located in New York State, including several located within a one-and-a-half to three-hour drive of Manhattan. To be frank, the main thing these hills have on their side is their proximity to New York City. If you want to reenact a trip to the Alps or Aspen, you’re going to be disappointed, but if you want to plan an affordable day or overnight ski trip, skiing in the Catskills region can be a great option. Ahead, we break down five of the best ski resorts less than 150 miles from NYC, along with everything you can expect when hitting these slopes. 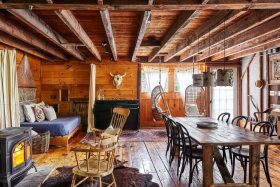 Tons of artfully created details, a wood-burning stove and modern comforts–from rain shower head to reading nooks–add up to a warm welcome at this upstate barn listed on Airbnb for $255 a night. It looks like a perfect escape from city life without having to rough it–and barns are cooler than cabins anyway. The hosts have been at this for a while, so they’ve got all the details covered, including wifi and a programmable smart TV so you don’t have to miss your shows. 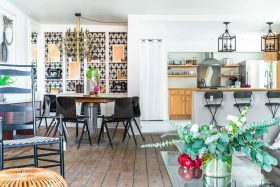 Set on four-and-a-half acres in the quaint-but-cool town of Tivoli, NY, about 100 miles from New York City in the Hudson River Valley near Bard College, the barn offers five beds on three levels, for up to six guests. If you’ve ever dreamed of getting out of the city (but not too, too far out), and nesting in a country estate amid rolling hills, White Duck Farm awaits. 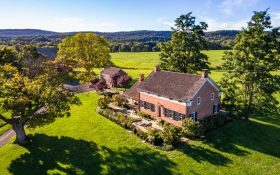 For $2.95 million, this 240-acre Ulster County estate is just a couple of hours from New York City in the Shawangunk Ridge-Mohonk Mountain Preserve, set back from the road and possessed of rolling pastures, woodlands, a pond, a pool, a party barn and a guest cottage–and a gorgeous, renovated brick Federal-style home (h/t CIRCA). Hudson, NY, is the place to head these days for a picture-perfect out-of-the-city weekend. Filled with fabulous restaurants, chic shops and darling dive bars, the Columbia County town’s mix of sophistication and small-town life hits just the right note. If you’ve dreamed of moving there and fixing up a quaint townhouse, you can live vicariously for a few nights–at $325 each, via Airbnb–at this charming carriage house. Featured on the Netflix renovation show, “Stay Here,” The Hudson River Carriage House is just a half block from the Warren Street main drag, but it’s so cute you may just want to stay in.